Renovations were a bit of a pain, but all in all a graet place to stay. Nice hotel. Gave free WiFi and late check out. Valet lane was extremely narrow due to construction, it was tight getting my truck in there. Every staff member was friendly, helpful, and informative. The location is very good for our stay in San Francisco. The staff were courteous and well informed. Nice hotel, great location close to Union Square. The only thing that’s terrible is ..parking ! Almost $80 per night valet and there isn’t really any other realistic option to park. I liked the hotel but probably will stay somewhere else next time in SF, where they charge more of a reasonable fee for parking. Nice hotel with an amazing location. It was a great hotel with amazing staff. From check in to check out the staff was incredibly friendly and helpful. The room was very clean and the bed was so comfortable it was hard to get out of in the morning. Staff was friendly and accomodating. Beds were comfortable and room was just big enough to meet our needs. Lobby is Under construction at the moment. Service and amenities are pretty good, not over the top. 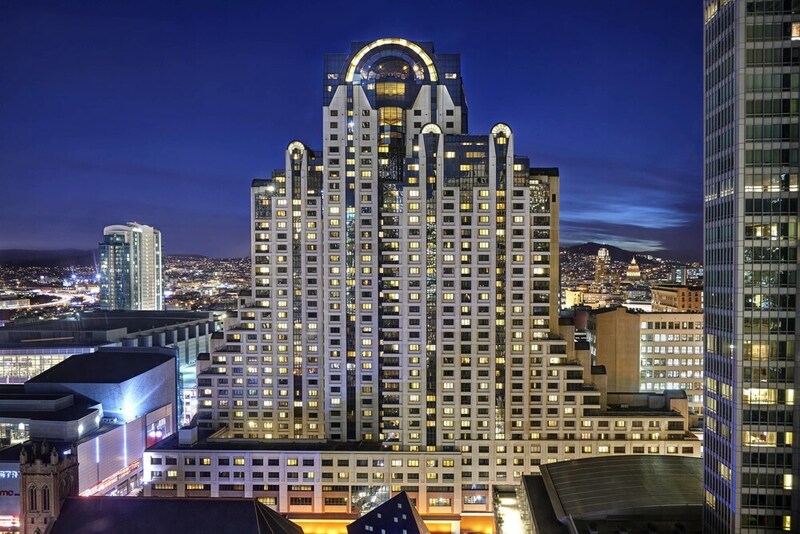 Located in Downtown San Francisco, San Francisco Marriott Marquis is within a 5-minute walk of popular attractions such as Powell and Market Cable Car Turnaround and Westfield San Francisco Centre. This 1500-room, 4-star hotel has 2 restaurants, a full-service spa, and a 24-hour fitness center. Enjoy dining at one of 2 onsite restaurants including B55 Craft House and Kitch, which specializes in Californian cuisine. At the end of the day, the bar/lounge is a great place to grab a drink. For your convenience, a buffet breakfast is served for a fee on weekdays from 6:30 AM to 10 AM and on weekends from 6:30 AM to 11 AM. A 32-inch flat-screen TV comes with cable channels, and guests can stay connected with WiFi and wired Internet. Beds sport premium bedding and the bathroom offers a hair dryer and designer toiletries. Other standard amenities include a coffee maker, a safe, and a phone. Guests of San Francisco Marriott Marquis have access to a full-service spa, a 24-hour fitness center, and conference space. Valet parking is available for USD 79.99 per day, and there's also limo/town car service. The 24-hour front desk has multilingual staff ready to assist with dry cleaning/laundry, concierge services, and securing valuables. Other amenities at this spa hotel include a business center, express check-out, and a terrace. Buffet breakfast is served on weekdays from 6:30 AM to 10 AM and on weekends from 6:30 AM to 11 AM for a fee. B55 Craft House and Kitch - Restaurant and bar specializing in Californian cuisine. Open daily for breakfast, lunch, and dinner. The View Lounge - Cocktail bar specializing in local cuisine. Open daily for dinner. Mission Street Pantry - Restaurant. Open daily. Recreation features at San Francisco Marriott Marquis include a 24-hour fitness center. The front desk is open 24 hours a day, and checking out is easy with express services. Driving? This property offers valet parking (fees apply), along with a car charging station.